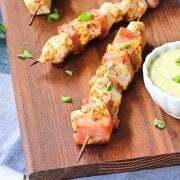 These easy chicken cordon bleu kabobs are a super fun take on the traditional combination of chicken with ham. The swiss cheese dipping sauce will keep you coming back for more. When you think of chicken cordon bleu, what do you think of? A heavy, fried, kind of outdated, rich chicken dish? There’s a time and a place for that but freshening things up is always a good idea too. Of course, I’ve already done a baked version of a this classic dish to create a healthier chicken cordon bleu, but isn’t everything a liiiiiiittttle more fun on a stick? These fun and easy chicken cordon bleu kabobs are not only a great dinner (kids think they are awesome! ), but you could also put them on shorter sticks and make them a fantastic appetizer. February is Lactose Intolerance Awareness Month and if you happen to be lactose intolerant, you don’t have to miss out on this recipe. (Make sure to check out the easy hot chocolate recipe from last week, too!) While you could easily make this with regular milk, I made it with lactose-free milk and it worked perfectly. The swiss cheese in the sauce is low in lactose as well. The great thing about the cheese sauce (rather than the cheese being inside the chicken breast as it traditionally is), is that if you’re lactose intolerant, you can “start low and go slow,” beginning with just a bit of the sauce to see how your body responds to it before truly digging in. Once you dig in, I bet you’ll find it hard to stop! 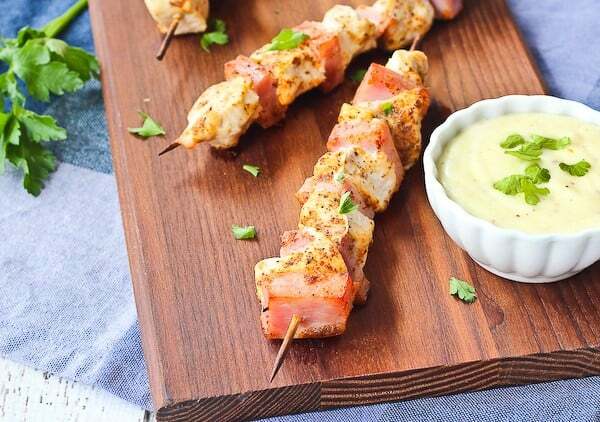 Don’t miss the video of these easy chicken cordon bleu kabobs! 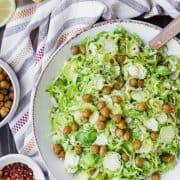 In a small bowl, combine dijon mustard, maple syrup, black pepper, paprika, and oil. Brush this mustard mixture onto the chicken kabobs. Broil (500 degrees Fahrenheit) for about 5 minutes, flip and continue to cook for 5 more minutes or until chicken is cooked through. Meanwhile, for the sauce, melt butter in a small saucepan over medium heat. Whisk in butter and cook for 1 minute, whisking constantly. Gradually add milk, whisking constantly. Add mustard. Continue to cook for 5 minutes or until thick. Reduce heat to low and stir in cheese, whisking until melted. 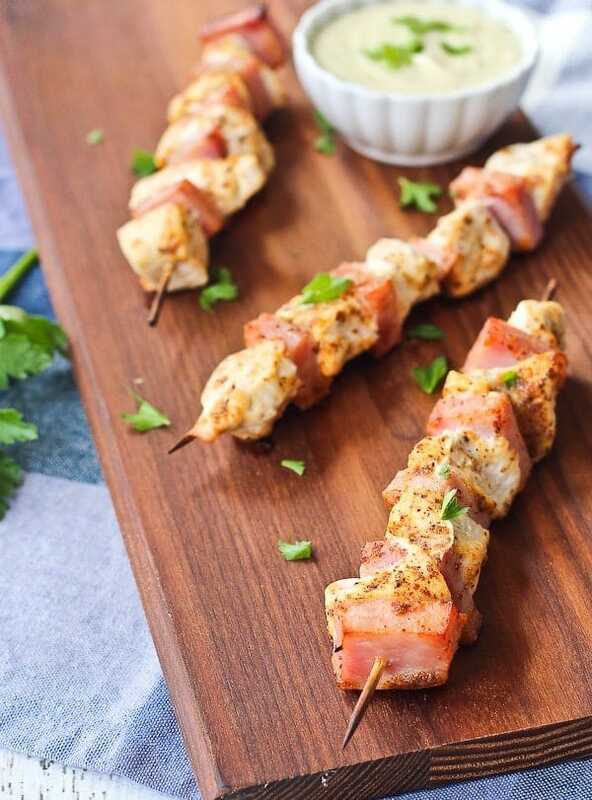 Serve immediately with chicken and ham kabobs. Note: if using wooden skewers, soak in water for 1 hour prior to adding chicken and ham to prevent them from catching on fire. Verdict: Loved these! The flavors are spot-on and the Swiss cheese sauce is completely irresistible. Husband’s take: Meat, on a stick. What dude wouldn’t be into that? PS: Looking for more chicken on a stick? DUH. Try my chicken kofta or chicken tawook! PPS: Is beef more your style? These citrus beef skewers with grapefruit are SO good. PPPS: You need dessert. On a stick, clearly. These patriotic fruit skewers would be perfect! My family down south would love this! 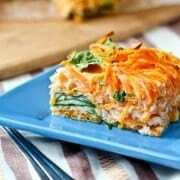 These are downright genius and so much easier than the traditional recipe. Love! Looks delicious! Chicken cordon bleu was always one of my favorite dishes! I totally think of the old fried outdated dish when I hear the term chicken cordon bleu. SO nice to see and updated and healthy spin on a classic! Don’t forget to remind people to soak the skewers if wooden ones are used. These are so fun and creative! I definitely have to try them! Thanks Brianne! I hope you love them! Kebobs are so much fun to eat! These look crazy good! Your dipping sauce is genius! I love what you have done here! 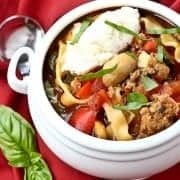 Such a fun and creative way to make a favorite classic meal! I bet kids are all over these! Everything is more fun on a stick right?! Great photos!